My last three posts showed you my Liberty Four Patch progress step by step. Forth step : putting the basted three layers on the hoop and starting hand quilting. After trying many kinds of batting (synthetic, cotton, wool) I found out that for hand quilting the synthetic one gives the best result. You can almost get the Trapunto look by making very small stitches and slightly pulling the thread. The second picture shows how I use my hoop to quilt the border. After hand quilting is finished, I sewed the binding as shown here and here, and this is the last step. Spring is beautiful these days, and it was so pleasant to quilt outside, especially when the quilt colors are in harmony with the garden! I cannot prevent myself from sending you pictures of my flowers. I like using premium poly in my quilts too! 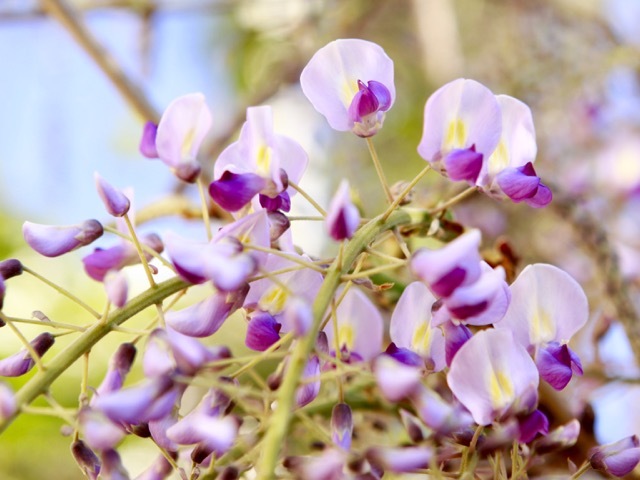 Your little flowers are just lovely! I love to see your tutorial. Flowers are pus. 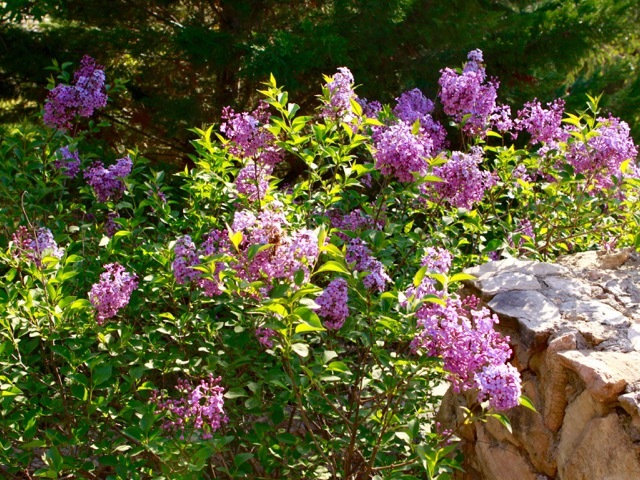 I love lilacs. Cela fait un très joli rendu cette fleur quiltee, et les fleurs sont superbes dans ton jardin. Cela me fait penser que je vais retrouver mon muguet et mon lilas. J'adore le printemps c'est très gai toutes ces couleurs. Beautiful peek at your Liberty quilt. A lovely spring project. What beautiful stitches! Love the flower you selected for the hand quilting. Your hand quilting is beautiful. Our spring is very slow to arrive this year and your lovely garden photos are welcome! I prefer poly batting as well. I know many quilters who look down their noses at those of us who use synthetic battings, but I remind myself that it works for me ... and who appointed them as the Quilting Police? I certainly did not. ha! I love your garden photos ... we're a few weeks behind, so it's nice to see some lovely flowers in bloom. we all need to use the batting we are comfortable with, I always like 100% cotton until I discovered cotton/wool blend, I really like that one now. I am looking forward to seeing that finished quilt. I really love the way the flower stencil turned out. Christine your hand quilting is perfect! Your hand quilting is so wonderful. Such tiny little stitches. Your hand stitching is very beautiful. Interesting that you like polyester. I don't like it for machine quilting. I love your hand quilting. The polyester does give a good loft to the quilting. Beautiful hand quilting!! 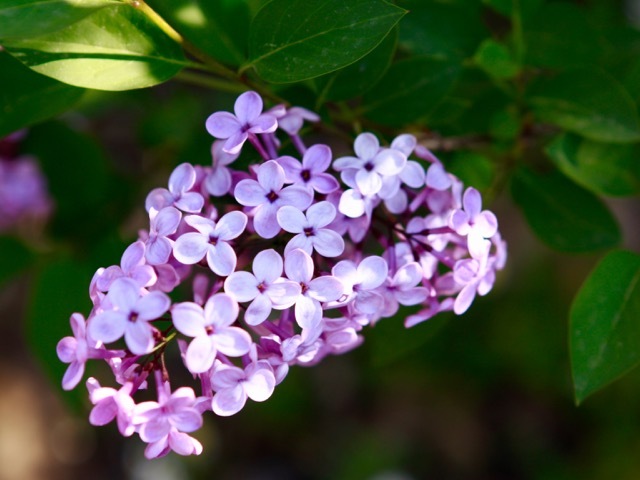 Lilac time - how lovely, one of my favourite garden shrubs. Your hand quilted flowers add so much to this quilt! I love your choice of binding too. Your flowers are lovely. I can almost smell the lilacs. What a beautiful hand quilting pattern. Your stitches are lovely. I enjoy seeing your progress - such beautiful stitches. Your quilting is amazing. It is really a trapunto look!! For almost May it is still cold in The Netherlands, but we enjoy more and more springcolors too!! Thank you very much Maartje! What lovely hand quilting! 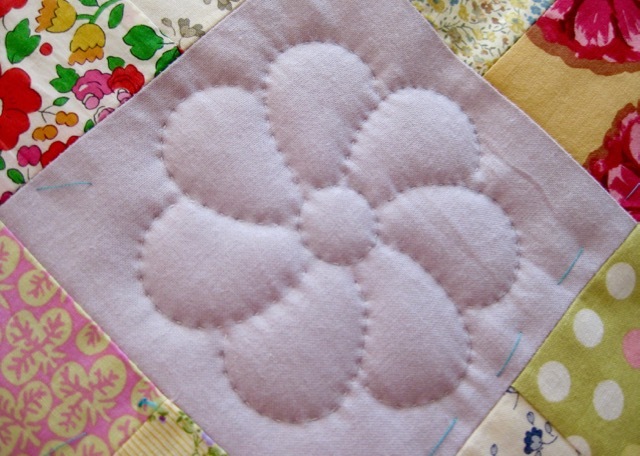 The flower motif is just right for your quilt! 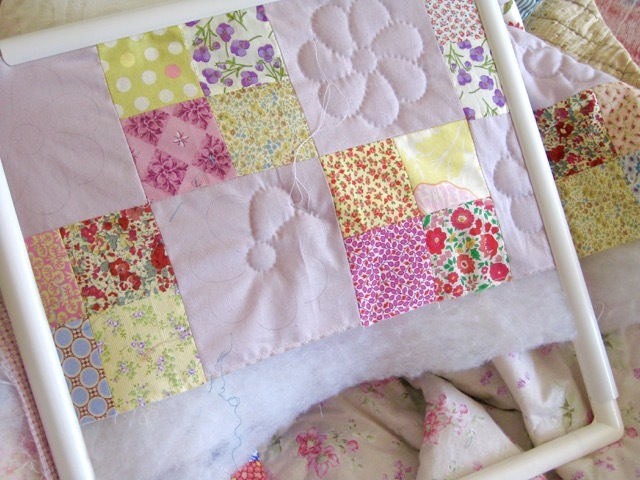 Your flower stencil was the perfect choice, as your hand quilting of that design is such a compliment to this quilt. Nice to see you have been enjoying your quilting outdoors. Gorgeous pics! And the updates to your blog are fabulous, Christine! Beautiful project and stitching Christine. Your hand quilting is perfect -- the patience and talent is admirable. Thank you for sharing your lovely work and the process. It is appreciated. There's just nothing that beats the look of hand quilting...and yours is superb! What a beautiful project. Those are beautiful, neat and even stitches! Your quilt looks lovely, I shall have to give synthetic wadding a try after seeing how yours has turned out, thanks for sharing. Such a beautiful job on the quilting! I wish I had the patience to do hand quilting, but alas.... I've got the attention span of a squirrel. Great job! Lovely hand quilted flowers, this is going to be a special quilt. Your flowers are beautiful. However your gorgeous hand quilting out shines them all. There is nothing nicer on the eye than hand quilting. Your hand quilting stitches are so neat! I have used cotton batting for hand quilting (sometimes painfully), but I think my favorite batting is a light polyester for both ease of quilting and that puffiness that really shows the quilting--just as your work shows. This quilt will be so lovely. I just love seeing your hand quilting, and I have a terrible weakness for Liberty fabrics too so your progress shot here really appeals to me!! 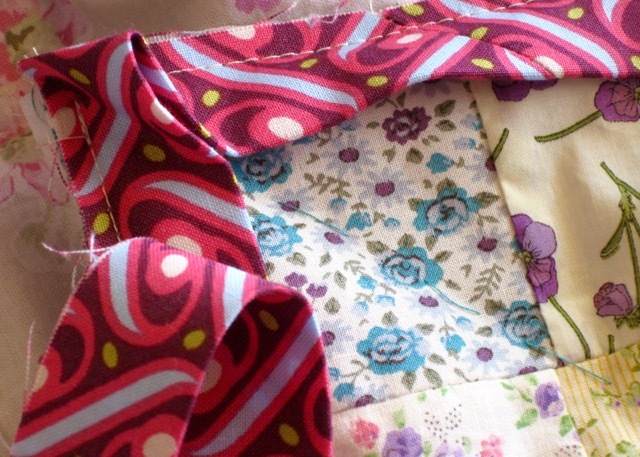 What beautiful hand quilting - it really makes the flowers pop with your oh so tiny stitches!